Who is your Facebook cartoon character profile picture until December 6? (The peaceful protest against violence towards children) Mine was Ursula, the sea witch. 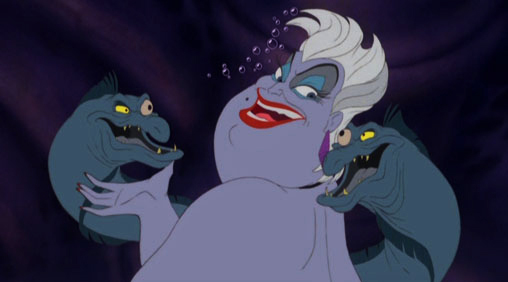 She is the overweight yet cool and seductive evil villain in Disney’s The Little Mermaid. In my opinion she’s the perfect villain, balancing out being intolerably evil and funny as hell! She is one of the full-pledged wicked antagonists that creeps me out by just merely looking at her mole. Add up her terrifying character, her husky smoky voice plus the spine-chilling humongous laughter, you’ve got a perfectly dark vicious piece of work. Aside from the magnificent soundtrack, for me, the reason why Disney’s The Little Mermaid movie was so successful was because of this terrifying fat octopus lady. Her song “Poor Unfortunate Souls” was even revived by Jonas Brothers. She swelled into monstrous proportions, she literally slashed boats apart with her tentacles, she crashed the ocean waves and she turned the heavens into stormy skies! Don’t underestimate the importance of body language! Life’s full of tough choices… isn’t it? Walang bida kung walang kontra bida! Yu pur unportyuneyt sowls!! !